I can't really take credit for my outfit today. I saw a very similar styled outfit on Callie from Coffee and Cardigans and I knew I had to recreate the look for myself. I love how blogs are just as inspirational as fashion magazines! Anyway, it also gave me an excuse to pair up items from my two favorite local vintage groups - two birds and Salvaged Strawberry. I love how this turned out! 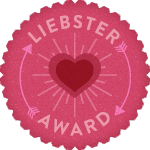 Speaking of the awesome Salvaged Strawberry, the very sweet Amanda has gifted me the Liebster award. 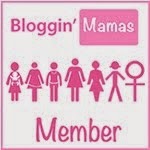 She states in her blog, "The Liebster award is given to upcoming bloggers who have 200 followers or less. The meaning of Liebster in German is sweetest, kindest, nicest, dearest, beloved, lovely, kind, pleasant, valued, cute, endearing and welcome". (I'm blushing now). 2. Answer the question the tagger set for you plus create 11 questions for the people you've tagged to answer. So, I'm going to answer the 11 questions from Amanda because they are fun and will give you all another little glimpse into my life! Here we go! 1. What is your favorite summertime activity? This one is hard to choose because there are several I enjoy, but I would have to say going out to eat at an outdoor patio is my favorite, you have to take advantage of the chance to do so in Minnesota when half the year it's too cold to do it! 2. Favorite Holiday and why? I used to always say Christmas, and while I do still love Christmas, as an adult it isn't quite the same. I think my favorite holiday is actually Thanksgiving. My birthday and the Pants Monkey's birthday is right around then, we have a huge gathering with the Pants Monkey's family and I am all about giving thanks. I feel like Thanksgiving gets kind of overshadowed being stuck between Halloween and Christmas, so I champion the little holiday that could. 3.Top 5 Favorite Movies. Go. Ho boy, only five?? Ok - The Muppet Movie, The Darjeeling Limited, Punch Drunk Love, Finding Nemo, Empire Records. Boom. 4. Salty or sweet? I used to be more of a sweets girl, but I'm getting more into salty. Chips and salsa are my favorite right now. 5. If you could live in any previous decade, what would it be and why? The 60's. I feel like a hippie at heart sometimes. Plus the music of the 60's is the bomb. 6. Do you have pets? What are their names? Tell me about them. Why yes of course! Most of my regular readers know all about my kitties. They are tuxedo cats, Taylor and Pippin. I love my furballs. 7. Dream job? Man. I wish I had one. I struggle with that actually. I'll go with my standard answer of wedding singer. I do sing at weddings here and there, but not enough to say I make a living at it! 8. How did you come up with the name for your blog? 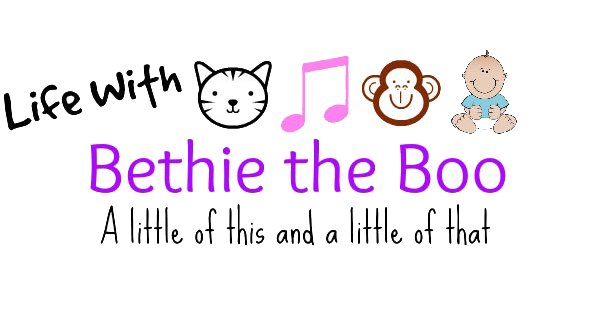 I have told this story before but will repeat for the newbies - I love Winnie the Pooh, my childhood nickname was Bethie Boo - I played off of the Many Adventures of Winnie the Pooh and got the name The Fashionable Adventures of Bethie the Boo. 9. First blog you read everyday? I go to my Google Reader list and kind of pick up where I left off the day before to be quite honest! I do have some can't miss blogs though - two birds, Megan Mae Daily and Tinfoil Tiaras I seek out if I only have a few minutes. 10. What's the latest recipe you really want to try? I want to make a Cookie Dough Cupcakes or Oreo Cupcakes. From scratch. I have pinned a few options to my Pinterest. It's just been too hot for baking. 11. What's one thing people would be really surprised to know about you? I get a rush out of shooting a gun. I go to the range with the Pants Monkey sometimes. It's a good stress reliever! 2. If money was no object, where would you like to travel most? 3. Describe to me your perfect day off. 4. What's your favorite guilty pleasure? 6. (Stealing Amanda's) Top 5 Favorite Movies. Go. 8. Coffee or tea or neither? 9. Last book you read? Do you recommend it? 10. What was your favorite childhood toy? 11. Do you have any bad habits? Anyone else who I didn't tag is welcome to answer the questions too, because I'd love to know more about all of you! And quite frankly, I wish I could tag you all too! Thank you again Amanda, you are too sweet! Yay! Love your answers! I love love Punch Drunk Love, too. It is def. not everyone's cup of tea. PT Anderson is sort of out there but in the best way possible. :) Also, love this shirt tucked in to that skirt. It makes your waist look teeny tiny! Love this outfit girl! Thanks for answering. You're the sweetest. Congrats on the award, Beth! Your outfit is so cute and the colors remind me of watermelon :) I had no idea that you sang at weddings, that's so neat! Thanks for the award, I was so surprised to see ME! 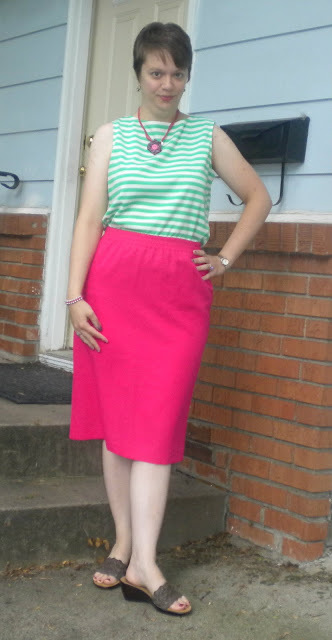 Congrats Beth..you have a cool blog and I enjoy reading your posts:) Love the striped top and pink skirt! I love this outfit. The color combo is awesome. I have never shot a gun but think I would be awesome at it. HA ha! 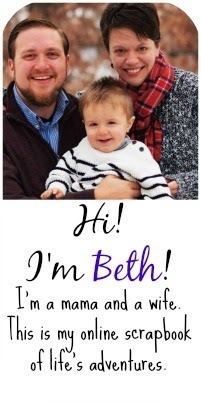 Congrats and thanks for the Leibster love, Beth! You are extra sweet. I agree with you that blogs are just as inspirational as magazines- maybe even more so because I love reading what each person has to say and getting to know them! You look absolutely smashing in that pencil skirt, Beth! Love it! Congrats on the award! You totally deserve it. I love your questions and will play along! - I'm more of a sorbet gal - any fruit flavour, but I love grapefruit. - Back to England, to explore the countryside and visit castles and ruins. - I like American Idol! I also love So You Think You Can Dance. Reality shows where the people actually have talent. Oh, I also really love The Biggest Loser - I find it inspirational. - The autumn, especially October, my birthday month. - Breakfast at Tiffany's, Star Wars (the original trio), The Princess Bride, The Breakfast Club, Lord of the Rings (all 3 movies!). But hard to choose - I love movies. - all of them! I hate cleaning, doing dishes, cooking, laundry, you name it. - 1 cup of coffee in the morning, then I'm on to herbal teas for the rest of the day. - Fahrenheit 451 by Ray Bradbury. I highly recommend this early sci-fi/futurism novel. It's a classic for a reason. - I made my own paper dolls, and copied outfits I saw on TV for them. I used to have a huge box of them. I wish I still had it. - I'm rabid about dental hygiene and I'm guilty of picking my teeth in public. congrats on your award. you are pretty sweet! and i love the shirt tucked into the skirt...what a great look for you. also, if you ever decide to make cookie dough cupcakes, please share!! also, thanks for calling us a can't miss...you made my day! Congrats on the award! I love this outfit since i think maybe it's the most form fitting I've seen you wear! Also, I would have never imagined you liked shooting! so funny! Awww, thanks! I like your facts! I'd love to hear you sing! Live vlog?! Missy Miller was always trying to make me play my flute on my blog and finally I did at Christmas, though only for a silly 'guess the tune' Christmas quiz! Omgomgomgomg I LOVE this look. Pink and green and buttonflower! Love it. Seriously, I don't have words to express how cute this is. I enjoyed your answers! Thanks so much for the shout-out. I snagged your questions to use for my post today. It'll be up late, but I wanted to let you know. Thanks for tagging me with the award!! I can't wait to answer those questions and do a post :) It may take me a couple of days but I'll have some time this weekend. Lovely outfit! You look so chic :) Congrats on your award! Thanks for sharing your answers. It's nice to get to know you better! I love that skirt! I have a similar one that I thrifted and I love belting it also... it seriously looks cute with everything and you are going to get so much wear out of it. I love your kitties, and I definitely prefer salty to sweet as well - chips & pretzels are my weakness. thank you again for nominating me for the award too. i'll have to answer these questions on my blog this weekend, it's always fun to read other people's answers and get to know people a little better!